Art Nouveau Artists from Rene Lalique to Louis Comfort Tiffany, Anton Gaudi and Archibald Knox. A selection of the great many art nouveau artists and designers that embraced the art nouveau style. There were many gifted artists and designers in the art nouveau period. It brought forward artists and designers with a feel for the natural organic lines that appeal to many of us. Many whose work is now highly valued and sought after by art nouveau collectors and fans of the style. When comparing and contrasting the work of these designers, it is easy to see why the Art Nouveau style is so hard to categorise and why there has been a prolonged debate about what Art Nouveau actually is. Whatever the definition, the artists work speaks for itself whether they specialise in architecture, glass, sculpture, pottery or porcelain. American graphic artist Bradley’s work drew on the contrasting influences of William Morris and Aubrey Beardsley and his illustrations were among the earliest examples of American Art Nouveau. Trained as a wood engraver in the mid -1880s, he turned to line engraving as his first technique became obsolete. His covers for the Chicago journal Inland Printer in 1894 established him as an exponent of the new style, and he gained widespread acclaim for his posters for another Chicago publication, The Chap Book. In 1895 he returned to his birthplace Massachusetts, where he turned to traditional printing methods, the result being his own periodical Bradley: His Book. Colonna trained in Brussels and moved to the United States in 1882. After briefly working for Associated Artists, the company of Louis Comfort Tiffany, he moved to Ohio, where he produced a series of designs published as the Essay on Broom Corn. The book reveals Colonna to have been a visionary designer. He returned to Paris in 1898 to work for Siegfried Bing. Along with Georges de Feure and Eugene Gaillard, his designs formed the nucleus of Bing’s pavilion at the 1900 Paris Universal Exposition. Prominent in the Arts and Crafts Movement and strongly influenced by the Pre-Raphaelites, Crane was both a fierce critic of Art Nouveau and an early inspiration for many artists who adopted the style. His illustrations for Fiord’s Feast (1889) display many of the features of Art Nouveau. Crane exhibited in Belgium in the early 1890’s where his work reached a progressive audience, and from 1894 he produced designs for the Kelmscott Press, set up by William Morris. Endell moved to Munich from Berlin in 1892, where he studied aesthetics, philosophy and psychology, before turning to architecture and art with the encouragement of Herman Obrist. His designs and illustrations, which appeared in journals such as Par, featured abstract natural shapes that show Obrist’s influence. Endell is most renowned for the distinctive facade and interiors of the Elvira photography studio in Munich (1897 -8), his first architectural design. As well as being a major figure of German Jugendstil, Endell anticipated abstract art in his writings on art theory in books such as Um die Schonheit (On Beauty) of 1896. De Feure worked as an actor, a costumier and then as an interior decorator. He also painted watercolours and oils, often of delicate women in a sensuous Symbolist style that illustrates the links between Symbolism and Art Nouveau. De Feure first exhibited furniture in Paris in 1896 and began working for Siegfried Bing in 1899. In 1900 he designed elements of Bing’s pavilion for the 1900 Paris Universal Exposition, where his work was praised for its French refinement. De Feure continued to design commercially until the outbreak of World War 1 in 1914. Suspended from the Academy of Arts in St Petersburg in 1894 for participating in student unrest, Fomin joined the office of Fyodor Shehktel’ after working for the architect Lev Kekushev. During his time with Shekhtel’ he contributed to the 1902 New Style exhibition. His designs display a monumental simplicity that alludes to traditional Russian styles as well as the modern geometry of Art Nouveau from Vienna and Glasgow. The son of a goldsmith, Fouquet took over the family firm in 1895 and soon adopted the Art Nouveau style. In 1900 he produced jewellery designed by Alphonse Mucha and won a gold medal at the Paris Universal Exposition. Mucha also created the interiors of Fouquet’s shop in 1901 Although initially inspired by nature and Japanese art. He went on to make more geometric pieces with Egyptian motifs, resulting in a revival of his fortunes in the 1920s with the advent of Art Deco. Gaillard rejected a career in law to take up interior design and decoration. Siegfried Bing employed him alongside Georges de Feure and Edouard Colonna to create interiors for his pavilion at the 1900 Paris Universal Exposition. The abstract natural forms of his furniture reflected a mistrust of historicism and he became a vocal advocate of modern design. Around 1903 he left Bing’s atelier and set up his own firm. In 1906 he published A Propos du Mobilier (On Furniture). Trained in Helsinki and Paris, Gallen-Kallela painted National Romantic landscapes, before adopting a Symbolist style in the 1890’s He was intrigued by traditional art and life in rural Karelia, and turned his artistic attention to the Finnish epic the Kalevala. Gallen-Kallela was a defining figure of Finnish Art Nouveau. His country house ‘Kalela’ combined traditional and modern ideas, as did his designs for textiles and stained glass. Murals for the Finnish pavilion at the 1900 Paris Universal Exposition brought his work to an international audience. 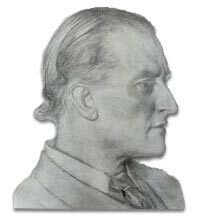 During the 1910s and 1920s he had close ties with the German Expressionists, but he later returned to the Kalevala embarking on a plan to fully illustrate the story. Guimard studied at the Ecole Nationale des Arts Decoratifs and the Ecole des Beaux -Arts in Paris. He then embarked on an architectural career that produced some of the most innovative buildings of Art Nouveau. The influence of Eugene-Emmanuel Viollet-le-Duc was apparent in his use of ironwork, and his designs for the new Paris Metro stations of 1900 combined daring linear forms with industrial methods of construction. Guimard also designed a number of houses during this period, as well as a range of furniture and objects that reflected the contrast between his abstract flowing style and the more figurative Art Nouveau of Nancy. In later years Guimard was uncomfortable with Modernism. He left France for the United States in 1939. Hoffmann studied under Otto Wagner in Vienna, and in 1896 began working in his office. He joined the Secession in 1897 and became a professor at the Kunstgewerbeschule in Vienna in 1899. He was initially attracted to the sweeping decoration of Jugendstil, however, his style soon became more geometric. In 1903 Hoffmann set up the Wiener Werkstatte, to which he contributed a vast range of furniture, metalwork, glass, ceramics and textile designs. He also provided the backbone of its architectural practice. Fidus trained in Lubeck and then Munich, where he lived on the commune of the painter W Diefenbach. In 1892 he moved to Berlin and set up another commune. His early illustrations contained dream like Jugendstil abstractions, and his work appeared frequently in Jugend. Fidus held mystical Theosophical beliefs and during the 1890’s he became interested in German mythology. His engravings of peasants and warriors evoked an insular worldview at odds with the internationalist outlook promoted by many German artists after 1900. In 1883 Klimt opened a studio after training at the School of Arts and Crafts in Vienna. His early paintings were academic in style, but he became increasingly influenced by Symbolism, provoking bitter criticisms from Vienna’s artistic establishment. In 1897 Klimt was one of the founders of the Secession, becoming the group’s first president; he also set up the journal Ver Sacrum. The Beethouen Frieze, painted in 1902 to decorate the Secession Building, signalled an even more stylised aesthetic. Klimt remained a prominent figure in the Secession until he resigned in 1905. Macdonald was born in England and came to Glasgow with her family around 1890. She enrolled as a day student at Glasgow School of Art where she met Chalres Rennie Mackintosh and Herbert McNair. She left the School in the mid 1890s and set up an independent studio in the city with her sister, Frances. The sisters worked together until Frances’s marriage and departure for Liverpool in 1899. Margaret married Charles Rennie Mackintosh in 1900. Collaboration was key to Margaret Macdonald’s creativity. The partnership with her sister in the 1890s produced metalwork, graphics, and a series of book illustrations. Her collaboration with Mackintosh comprised primarily the production of panels for interiors and furniture, notably for the tea rooms and The Hill House. The precise nature of their partnership is difficult to define, because little documentation survives. However it is certain that Macdonald played an important role in the development of the decorative, symbolic interiors of the early 1900s, including the House for an Art Lover portfolio, the Rose Boudoir, Turin and the Willow Tea Rooms. Ill health and the strain of Mackintosh’s declining career contributed to a decline in her own output and no work after 1921 is known. Margaret Macdonald died in London in 1933, five years after her husband. The largest single holding of Margaret Macdonald’s work is housed at the Hunterian Art Gallery, University of Glasgow. Mackmurdo studied at oxford and was a disciple of John Ruskin. He was a leading figure in the Arts and Crafts Movement, yet, like Walter Crane, his work also contained the seeds of Art Nouveau. His designs for wallpaper and textiles, together with his chairs for the Century Guild, display the flowing linear style of Art Nouveau. The Century Guild, of which he was a founding member, ceased its activities in 1892, and he gradually turned towards classical architecture. A H Mackmurdo was originally a friend of William Morris, founder of the Arts & Craft Movement. Along with Morris, he was involved in setting up the Society for the Protection of Ancient Buildings. Over the years, though, Mackmurdo became far more interested in the idea of mass production, in order to get the beautiful (and increasingly practical) homewares they designed to the ordinary. This was firmly against Morris’s basic principals of hand-crafting, and they followed very different paths. Kunst in 1897. Committed to the design reform aspects of Art Nouveau as well as its aesthetic, he resolved to put his ideas into practice when, in 1899, he set up La Maison Moderne. The aim of this shop was to promote modern design to a broad public. Though initially successful, it folded in 1904 as Art Nouveau became unfashionable. Swiss-German designer. Perhaps the pivotal figure in the development of Jugendstil in Munich, Obrist encountered the Arts and Crafts Movement when travelling in Britain in 1887, where he trained as a ceramicist. His work gained a gold medal at the 1889 Universal Exposition in Paris. Following his move to Munich in 1894, Obrist came to prominence in 1896 with an exhibition of thirty -five embroideries that exemplified his abstract approach to nature in art. A founder of the Munich Vereinigte Werkstatten fur Kunst im Handwork in 1897, he was also a prolific writer and teacher. His ideas about abstraction influenced the Russian artist Wassily Kandinsky. Like Josef Hoffmann Olbrich worked in the office of Otto Wagner in Vienna from 1894, becoming chief assistant in 1896. in 1897 he was involved in founding the Secession, and his design for the Secession Building, begun 1898, announced the importance of the classicism in Viennese fin-de-siecle architecture. In 1899 he was invited to join the artists’ colony at Darmstadt, where he designed a series of houses, studios and galleries. Olbrich helped set up the Deutsche Werkbund in Munich in 1907. Though he trained as a painter at the Munich Academy, Riemerschmid was best known for his furniture designs, which he turned to in 1895 after being inspired by the Arts and Crafts Movement. In 1897 he co-founded the Vereinigte Werkstatte fur Kunst im Handiwork. He displayed an interior scheme, the ‘Room for an Art Lover’, at the 1900 Paris Universal Exposition, and in 1901 he designed one of Munich’s most celebrated fin-de-siecle buildings, the Schauspielhaus. In 1903 he joined the Dresden Werkstatte. His designs betrayed a simplicity that set them apart from more elaborate Art Nouveau, and his series of Machinenmobel (‘machine-made furniture’), first exhibited in 1906, showed his engagement with modern manufacturing. In 1907 he helped found the Deutsche Werkbund. After studying in Moscow, Shekhtel’ worked for the architect A Kaminsky, a member of the Mir Iskusstva artists’ group. His early work combined traditionaI styles with Art Nouveau to create a specifically Russian variant. Between 1900 and 1902 he built mansions in Moscow, and in 1901 designed the Russian pavilions at the Glasgow International exhibition. His office was behind the 1902 New Style exhibition in Moscow, which showcased Western and Russian designers. Gustave Serrurier-Bovy (1858 -1910) Belgian architect and designer. Serrurier trained in Liege in the 1870s, where he encountered the teachings of John Ruskin, William Morris and Eugene-Ernmanuel Viollet-le-Duc. In 1884 he set up a company in Liege selling imported wares and his own furniture. Serrurier exhibited at La Libre Esthetique in 1894 and 1895, and in 1897 he contributed to the Congo pavilion at the Brussels Universal Exposition. He opened a branch of his business in Paris in the same year. The Pavilion Bleu, a restaurant built for the Paris Universal Exposition 0f 1900, was one of the few examples of unrestrained Art Nouveau architecture. After visiting Darmstadt in 1901 he adopted more simplified forms. Sullivan studied in Boston and worked for Frank Furness in Philadelphia, before joining the engineer Dankmar Adler in 1880, where he became a partner in 1883. In the late 1880s they built steel -framed skyscrapers that combined Adler’s engineering skills with Sullivan’s decorative genius. His stylised forms derived from the Gothic Revival, yet they offered a radical new style for modern buildings and constituted a uniquely American Art Nouveau. Sullivan’s retrospective explanation of his ideas, the System of Architectural Ornament (1924), reveals an element of mysticism. French painter and graphic artist. Toulouse -Lautrec began painting in Paris in the 1880s and studied under the Symbolist Emile Bernard, exhibiting at the Salon des Independants from 1889. In 1891 he designed his first posters, for which he received widespread acclaim. His posters brought his stylised representations of decadent Parisian life to a broad public. Henry van de Velde (1863 -1957) Belgian architect, designer and painter. After studying painting in Antwerp and Paris, Van de Velde turned to the decorative arts in the early 1890s inspired by William Morris. He was opposed to historicism and created designs based on flowing, abstract forms. In 1895 he built and decorated a house in Brussels, Bloemenwerf, for himself and his wife. He met Siegfried Bing and designed rooms for his gallery in Paris. Following an exhibition of Bing’s rooms in Dresden in 1897, and partly as a result of the dealer’s increasing preference for French styles, Van de Velde moved to Germany. He received commissions in Berlin and met his patron Karl Ernst Osthaus in 1900. He helped found the Deutsche Werkbund in 1907, but clashed with the critic Hermann Muthesius because Van de Velde saw standardisation as a threat to the creativity of the individual artist. Eugene Emnanuel Viollet-le-Duc (1814-79) French architect and writer. The self taught architect Viollet-le-Duc was the most famous proponent of the Gothic Revival in France. He was best known for restorations at Pierrefonds and Notre Dame cathedral in Paris, but despite his reverence for the Gothic, he was also a critic of eclectic historicism. His lectures Entretiens sur L’architecture (Treatises on Architecture; 1863 -72) advocated the adventurous use of iron and glass. Art Nouveau architects including Victor Horta, Hector Guimard, Antoni Gaudi and Louis Sullivan all cited Viollet as an influence. After working for the Gothic Revival architect D Seddon, Voysey began his own firm in 1882. He was a central figure in the Arts and Crafts Movement, joining the Art Workers Guild in 1884 and showing at the Arts and Crafts exhibitions in London from 1893. Chiefly remembered for his simple houses, he also designed patterns and furniture during the 1880s that displayed a lyricism which anticipated Art Nouveau. Wagner encountered the work of Karl Friedrich Schinkel while studying in Berlin, and his work in Vienna illustrates the importance of classicism to Viennese Art Nouveau. In 1894 he was commissioned to design stations for the city, and in 1898 his two apartment blocks at 38 and 40 Linke Wienzeile were among the earliest examples of Jugendstil architecture in Vienna. Wagner joined the Secession in 1899, allying himself with the younger radical artists. His Post Office Savings Bank (begun 1903) exemplifies his modern classicism. Between 1888 and 1893 he worked in Chicago for Louis Sullivan, and the influence of Sullivan’s organic forms is apparent in his designs and writings. Wright’s early work displays close parallels with the development of Art Nouveau in Europe. From 1901 to 1913 he built a series of ‘prairie houses’ that combine low geometric forms and spaces with stylised ornament. Art Nouveau Artists & Designers shared almost the same beliefs as Arts & Crafts designers. They both valued quality and fine craftsmanship, but art nouveau artists were content to have their designs mass produced.